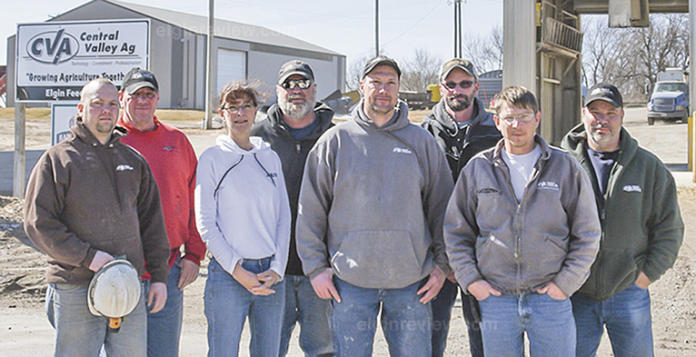 (Elgin, NE) – Central Valley Ag (CVA) feed mill in Elgin Nebraska recently went through their annual HACCP recertification inspection and received a perfect score of 100 percent. This year marks the third audit that the Elgin location has undergone to obtain their HACCP certification. “In the beginning, they were scoring in the high 99 percentile, but this year was a solid 100,” said Abby Simonsen, CVA HACCP Coordinator. Validus, the company who performs these audits, informed Simonsen that scoring a 100 percent is unique and is something they don’t see very often. The Elgin location should be incredibly proud of obtaining this perfect score. Six of Central Valley Ag’s feed mills are currently HACCP certified. Abby Simonsen, Ted Beckner, Robert Turek and Morris Volquarsen visited the location to congratulate the team on March 2, 2018. Photo submitted.